Oak Park, IL. Arthur B. Heurtley House, built 1902, designed by Frank Lloyd Wright. 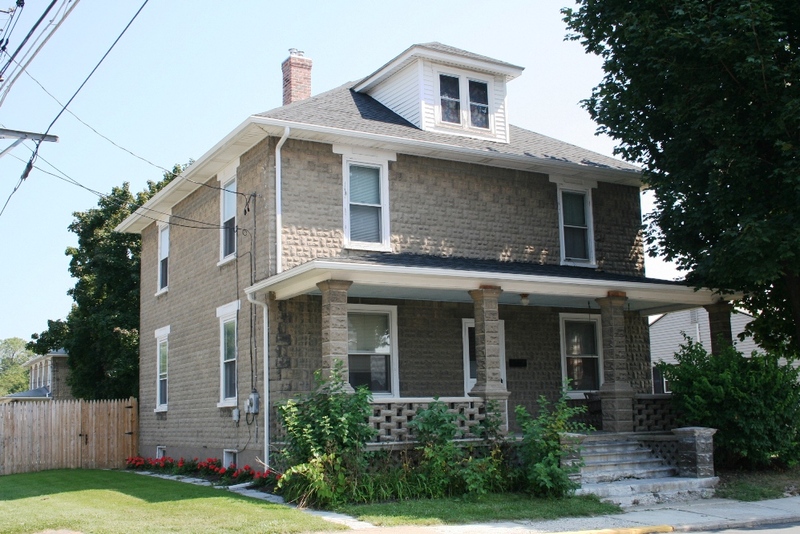 Considered the first-ever Prairie Style house, after his designs evolved into this genre. 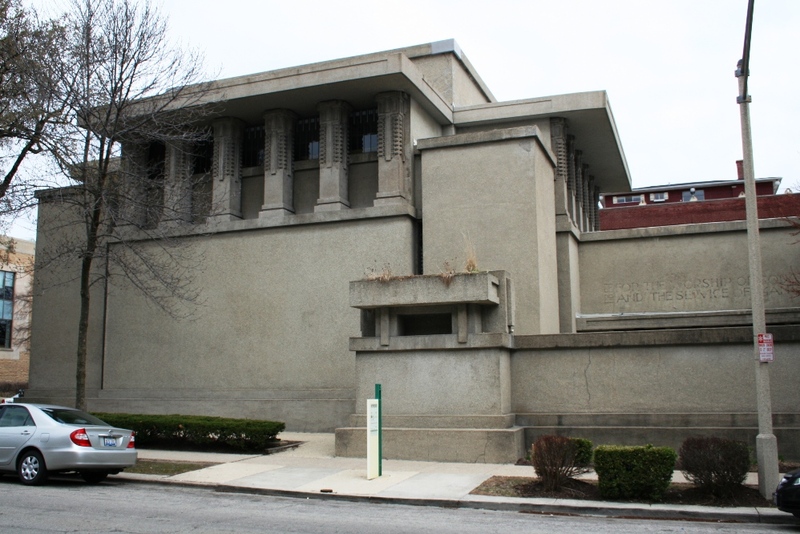 BACKGROUND AND INSPIRATION: This is one of the few indigenous American styles, developed by a creative group of Chicago architects known collectively as the Prairie School. 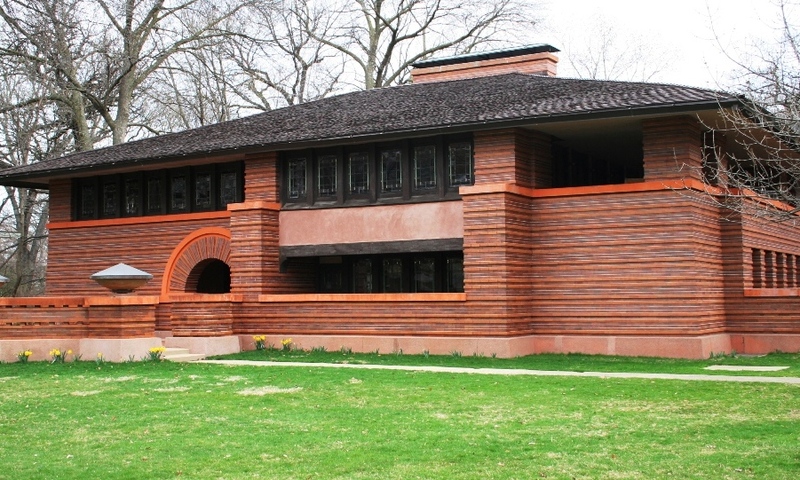 Frank Lloyd Wright is essentially the “father” of the Prairie style, and the acknowledged master of the prairie house. Considered one of America’s most influential architects, Wright proclaimed that “Democracy needed something better than the box”. Wright’s prairie style focused specifically on midwestern regionalism, with its horizontal, open floor plans representing the expansive prairie region. Though avoiding historical stylistic trends of the competing revival styles, the prairie style made subtle use of Japanese architecture, specifically its use of horizontal space, flowing interior spaces; low-pitched, hipped roofs with broad eaves, and long bands of windows that apparently invoke the idea of Japanese screens (small, patterned pane glass). Though short-lived in the U.S., this is the first American style to be taken seriously in Europe (Source: McAlester & McAlester). Oak Park, IL. An elaborate example of the American Foursquare, with pyramidal roof and dormer, boxy shape, two-and-a-half stories, full-width front porch, and craftsman porch piers and columns. The tiled roof and palladian-style dormer are Italian Renaissance features, essentially mixing revival and modern styles onto one house. 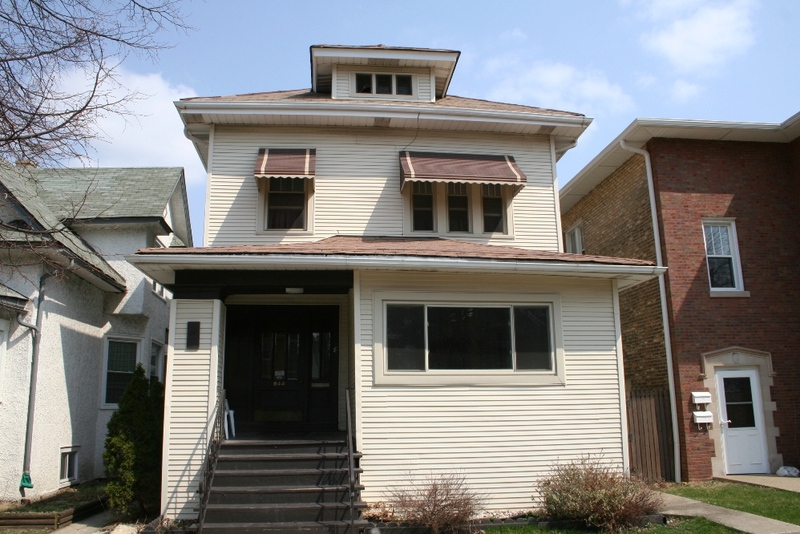 A vernacular variant, and much more common, is the so-called American Foursquare, or “Prairie Box”. These are simplified Prairie houses (though occasionally with elaborate facades and porches), named “Foursquare” due to their characteristic boxy shape and four rooms per floor. They are typically two-and-a-half stories with a large, central dormer. They often include a full-width front porch and four-room over four-room floor plan. 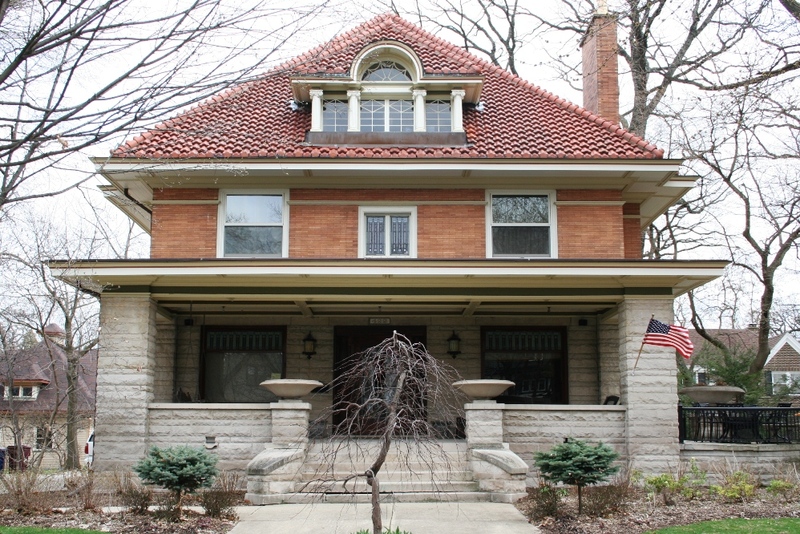 Many foursquare homes include various craftsman features including heavy piers and square columns, 4-over-1 or equivalent craftsman windows, wooden shinges, and exposed rafter tails. More Photos of Prairie and Foursquare on Flickr. Oak Park, IL. Unity Temple Unitarian Universalist Congregation church, c.1905. Frank Lloyd Wright, architect. Includes poured, reinforced concrete and cubist designs. Oak Park, IL. One can detect the Japanese influence in the flared, hipped roof and porch, combined with horizontal bands and ribbon windows. San Antonio, TX. 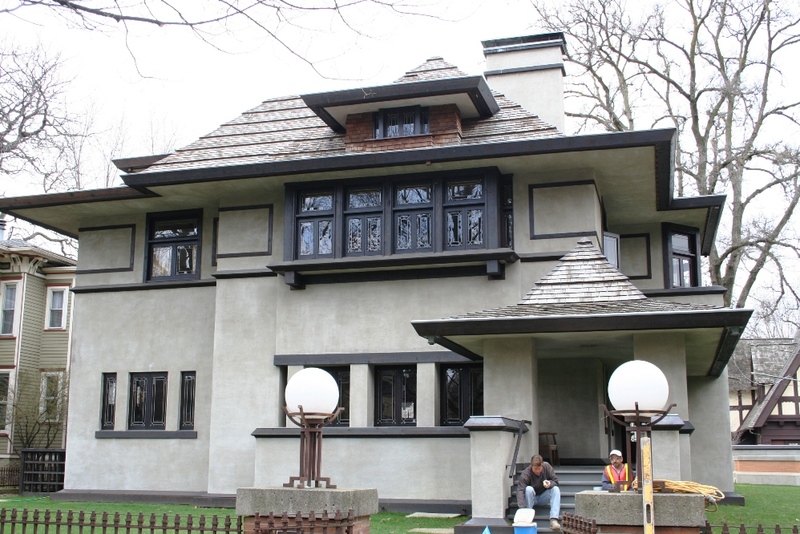 According to the owner, this home was designed by Frank Lloyd Wright. Dubuque, IA. 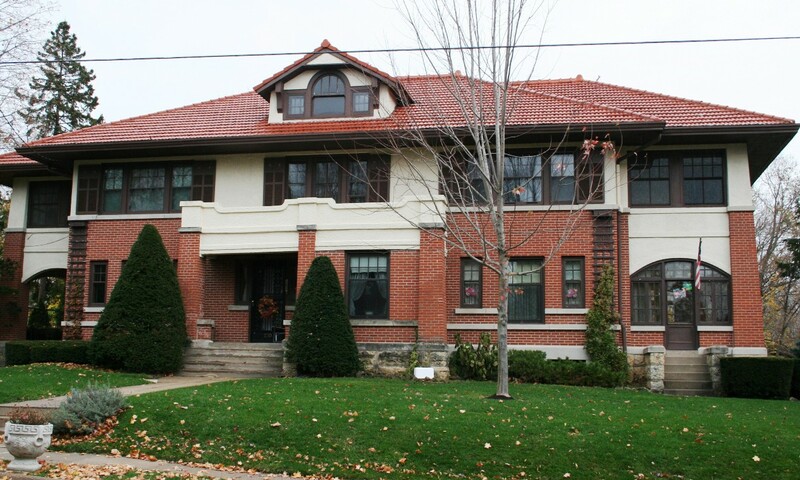 A large prairie style home in a wealthy suburb of the early 20th century. Forest Park, IL. A fairly typical foursquare. Forest Park, IL. A modest foursquare on a smaller suburban lot. Central Pennsylvania. 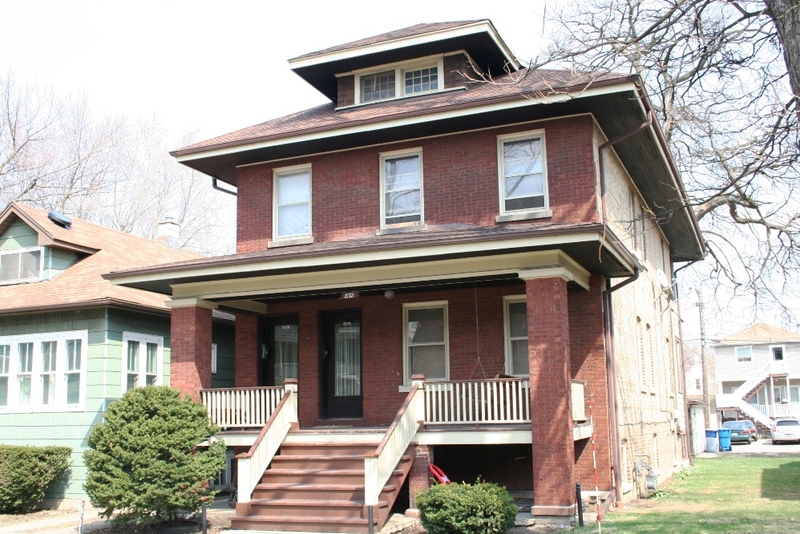 A more modest and common Foursquare, still with its hipped roof and dormer, and full-width front porch. 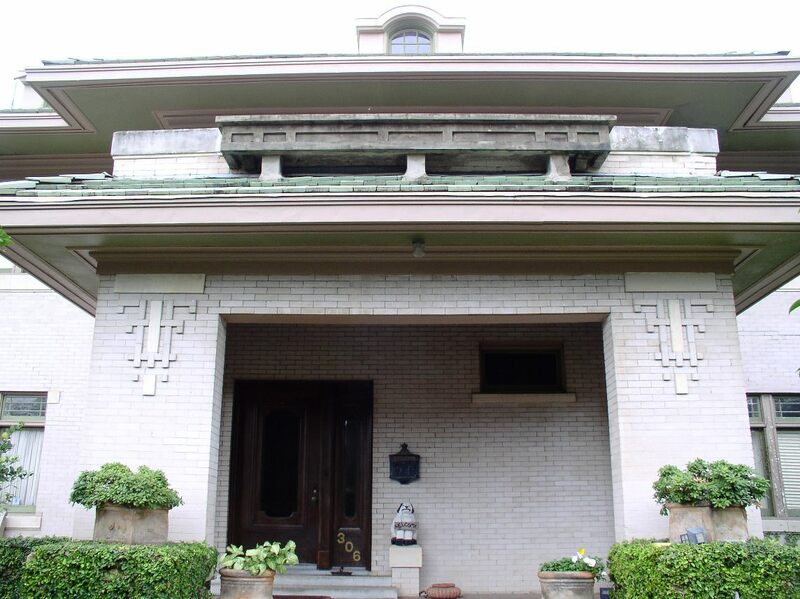 The house in San Antonio was designed by George Willis, who worked with Wright in Chicago for 4 years before moving to California, then San Antonio about 1911. A belated thanks for this information!